Message for the Wario Forums: Let me start by giving you all a big “THANK YOU” for your presence in my life! Thanks to you, I was able to find wonderful video games to play, allowing me to make my way in this new world! All of you have directed me towards a form of entertainment I was not familiar with and, today, I can say I am satisfied with the outcome of my arrival to this forum site! After playing Wario Land 4, and after being blown away by the great game that this title is, I needed more, I wanted more! It was then that Juan-kun (Juan “Shantae” Schwartz), the ultimate fan and supporter of Shantae of the forum, recommended me to play the very first game of the same name: “Shantae”. 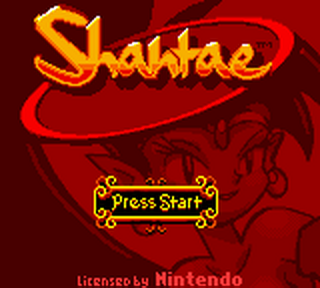 Shantae is a Game Boy Color game, released in June of 2002, that is now available on the Nintendo eShop, for the Nintendo 3DS, the version I will be reviewing. This is important information, which will become clear throughout this review. 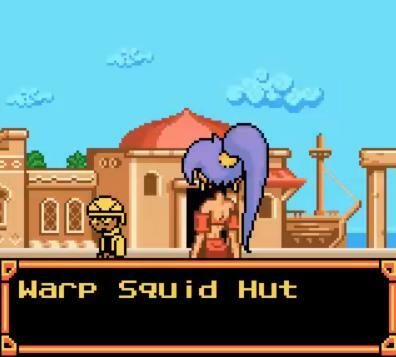 This is the very first adventure of Shantae, the main character of the game, a charming and upbeat belly-dancer genie girl, assigned as Guardian of her home town, Scuttle Town. Well, not exactly… You see, once upon a time, Sequin Land, name of the land in which Scuttle Town is located, was inhabited by both genies and humans, both of which lived in harmony. Of two came three, and relationships between them went beyond romance. Sadly, peace was broken, and genies vanished from Sequin Land. Some say that some of genies are still trapped in lamps! All vanished, except one. Her name is Shantae, of course. Saved from the event by her Uncle Mimic, she grew to become Scuttle Town’s guardian as the inhabitants think she is a genie, fully capable of protecting the town and land. However, she was the child of a genie and a human, thus being only “half-genie”, meaning she is not as powerful as everyone makes her out to be! Poor Shantae! She does not have the courage to tell everyone the truth! 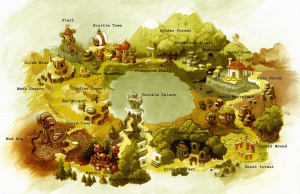 Map of Sequin Land! It goes in a circle ingame too! The game starts off in the Lighthouse of Scuttle Town, home of our protagonist, suddenly being attacked by cannon balls, shot from a distant pirate ship. The town is under attack, and it is Shantae’s duty to save everyone! It is now time to take control of her and cross the bridge to reach the town! Seems simple enough, if not for the shower of cannon balls, sending the message to the player that this is, not only the tutorial of the game, but also that this game is not one to give you a hand, as I managed to lose a few times before even starting! During a short conversation between the two, we find out that Risky is responsible for the attack and that she is looking for something to make her plan of conquering Sequin Land a reality! Shortly after, Shantae arrives at the burning Scuttle Town, being scavenged and destroyed by our newly met villains! With incredible detail, you will see inhabitants running for their lives, as the scenery changes colors from a bright daylight, to night, then to a burning orange, the heart of the fire! All of it mixed in with an upbeat and rhythmic Game Boy music, setting the first example of this game’s incredible soundtrack! Shantae will soon come across Uncle Mimic, who will inform her that the bandits stole one of his inventions, the Steam Engine, a powerful device capable of giving power to the whole town! We need to stop Risky and fast before she uses it on her plan! Soon after you reach the other end of Scuttle Town, you will find Risky Boots’ ship! It’s is your very first Boss battle of the game! All you have to do is avoid everything, while trying your hardest to hit the explosive barrels on board! 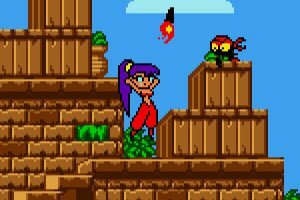 Once you finally manage to blow the barrels up, Shantae will fall down to a lower part next to the ship, where you have to hit each explosive barrel the bandits will try to throw at you, through the windows of the ship. Breaking all the windows will make the ship float away, indicating your victory! Congratulations! You just finished the tutorial of the game! Now it is time for the real deal! Shantae being attacked by a Tinkerbat, in Scuttle Town! The game takes place in Sequin Land, which you can travel in a free range sidescrolling fashion, allowing you to explore as much as your heart desires! The world, essentially, a bundle of stages connected to one another, each representing a location, which can vary from a desert, a forest to a snow mountain and even a graveyard! In between certain locations, you will find up to 5 towns you can visit, meet new characters, save your game, refresh your health in the Bath House or play mini-games! 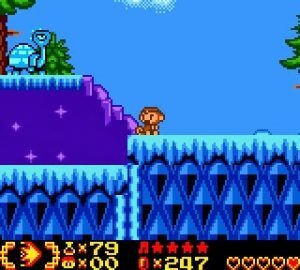 You explore towns in a different way than the platforming sections, as the view takes place in a over-the-shoulder perspective, feeling a lot more like a selection menu. Speaking of mini-games, there are a few you will play during your adventure. In Scuttle Town, you will be able to play the dance mini-game for gems you use to buy items in the Shop in each town, although the mini-game is only available at night. You can also bet your luck in the Gecko game in Oasis Town, which is a game of luck you will definitely want to try! Not only can you visit towns to play the said mini-games, but you can also visit the Squid House in each of them, and upon collecting 4 Baby Squids, you will be able to learn a way to teleport back to that town at anytime! Very useful, considering the level of difficulty and size of world! The baby squids are one of many collectibles in the game, and they are located in the palaces or dungeons of the game. During the night, you can look for fireflies, scattered all across Sequin Land to unlock a new power near the end of the game, and you will also find heart containers and other attack upgrades! Good luck to find them all! 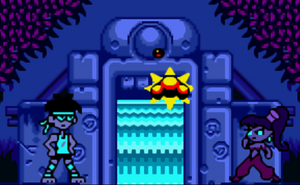 At this point, you may have noticed how Shantae’s controls work. The basics are simple, the D-Pad left and right to make Shantae walk, the A button to make her jump and the B button to make use her iconic hair whip attack! Pressing down on the D-Pad makes her crouch in a cat-like position and allows her to crawl under tight spaces, and holding down the B button while walking makes her run. During her adventures, Shantae will learn ways to trigger her powers by dancing! These powers can be an animal transformation, a teleportation to a town, or even healing! To trigger the dance mode, one must press the Y button on the 3DS (or the Select button on the Game Boy Color). 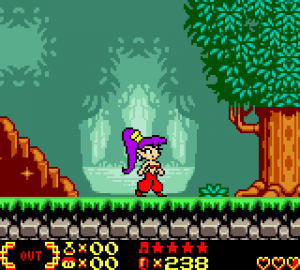 Upon triggering this mode, Shantae will start dancing following a certain rhythm, during which can press a sequence of inputs, either from the D-Pad, A or B buttons, in order to make Shantae release the wanted power. Confusing? Well, let me explain: if you want Shantae to transform into a monkey, one of many transformations the game allows you to trigger, you must first, press Y to enter dance mode, then following the rhythm, you must input down on the D-Pad and then right on the D-Pad. Getting the rhythm right at first can be difficult, however, you will get it right after practicing. You can exit dance mode at any time by pressing the Y button again. You will also be able to use items you buy in shops, like potions or pike-balls, by selecting them in your pause menu (press Start to open said menu). Once the item has been selected, you must press the B button while holding Up on the D-Pad. Yes, it is quite confusing and annoying after some time, as you may quite often trigger items unwillingly while attacking airborne enemies. If that is not enough, Shantae can learn a handful of new attacks, one of which is triggered by double tapping Up on the D-Pad! I found myself wasting half of my healing potions while attacking certain enemies. At least, the upgrades are powerful enough to clear most monsters in one or two hits. You will be able to check which upgrades you collected on the pause menu, they will all be added to Shantae’s picture, a nice little touch! Speaking of monsters, there are so many of them around Sequin Land! The variety is abundant and each of them has their own attack pattern! You will find snakes, spiders, demons, golems and much more! As an example, you can find evil scarecrows the jump from the background, or even little demons that pop out of the ground and throw lances at you! Danger is everywhere! Sadly, the screen is too small and sometimes the vision gets obstructed, so watch your step! One wrong jump and you might fall into some well placed spikes and instantly lose a life! Like I said, this game uses a life system as well as a health system. Once Shantae loses all her hearts/health, she will lose a life, and if you lose all your lives, you do a Game Over. If the ladder happens, you will restart were you last saved, however, you wont lose your progress in labyrinth! That is good news! In order to complete the game, Shantae needs to find four magical stones, that can be obtained after defeating the respective boss, hidden inside said labyrinth. Finding the labyrinth is another challenge, as you must traverse the vast world of Sequin Land to find their entrance, which sometimes is blocked or locked. 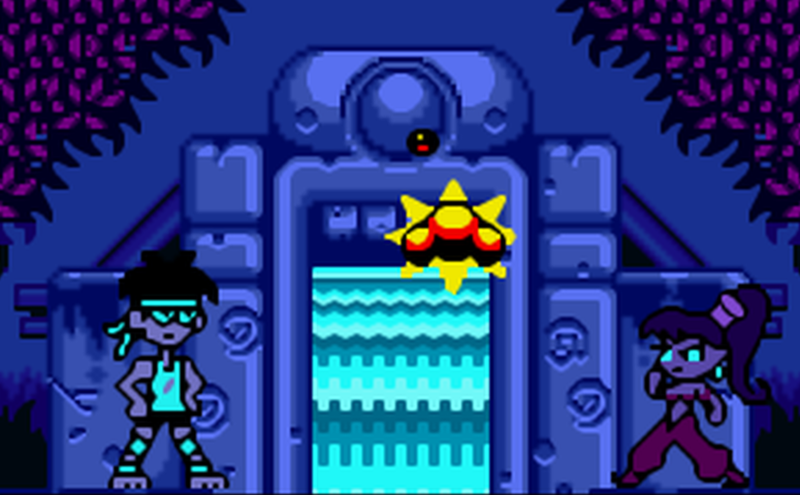 To open them, you will need help from Shantae’s friends and other characters you meet along the way. I won’t tell you who they are and where they hide, I will leave it up to you to find out! Bolo helps Shantae to open the entrance of Dribble Fountain! Although the game challenges the player with tricky difficulty earlier on, it also offers the most beautiful and colorful graphics the Gameboy Color can offer. The characters look exactly like their official artwork, making them recognizable, the background is detailed and never barren, keeping the exploration interesting from start to end. If that wasn’t enough, the soundtrack played is wonderful, pulling you in and making the whole travel feel more appealing! I truly believe both are still good by today’s standards! The forest, showcasing the wonderful graphics of the game. With that said, I can say the game is really solid. I had fun exploring and finding ways to overcome the challenges this game puts up. There are some minor problems, as mentioned before, however, after a bit of practice, those problems will not be a relevant as much, anymore. Charming and with an interesting story and relatable characters, this title is a must play! Would I recommend it? Yes, for those looking for a challenge, it’s perfect! Will I play it again? I most likely will! If I had to rate it, what would it be? I would give it a 8 out of 10, definitely good! Charming and with an interesting story and relatable characters, this title is a must play!